Betfair £100 free bet offer - Exclusive 100% matched bonus! BetAndSkill readers can get an exclusive free bet at Betfair when they join via this page or via our links and banners! The leading bookmaker is offering a 100% matched bonus up to £100! Promo code is ZSKACT! Hurry up! Wanna get a bigger bonus at Betfair! We have a special offer for you! Find below ho to claim up to £100 in free bets in few simple steps! Deposit up to £100 (your ‘buy in’) and Betfair will match it automatically and move the total into your bonus wallet. Just bet the total of your bonus wallet 4 times (on bets of min 1.6 or 3/5). Your bonus and winnings will then move into your main wallet, so you can withdraw. Enjoy your betting experience at Betfair! New customer offer. Place 5 x €10 or more bets to receive €20 in free bets. Repeat up to 5 times to receive a maximum bonus of €/£100. Minimum odds 1/2 (1.50 in decimal format). Exchange bets are excluded. Terms & Conditions apply. 1. Opt in on the first deposit page or find the offer in the promotions hub, claim your bonus and choose your bonus amount (min £4. max £100). 2. Your bonus amount will be 100% matched with money from your main wallet. This is your buy-in. e.g. Choose £10 bonus, buy-in with £10 from your main wallet. 3. Both your buy-in and bonus amount will automatically move to your bonus wallet. 4. Bet your total bonus wallet 4 times e.g. if your total bonus wallet = £20 . You need to bet a total of £80 ( £20 x 4) to release your bonus and winnings. 5. The bonus and winnings will automatically move to your main wallet once you have done this and you will be able to withdraw your money. 6. 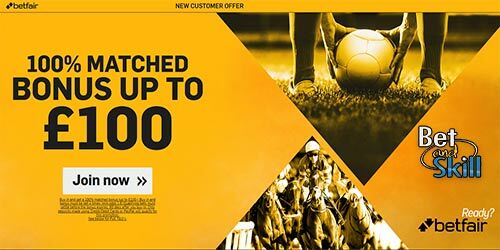 This offer is for New Betfair customers. 7. Single bets must be placed on selections with min. odds of 1.6 (3/5) to count towards the betting requirement of the bonus (x4 buy-in and bonus as specified above). 8. In multiple bets at least one selection must have odds of 1.6 (3/5) or greater to count towards any betting requirements. 9. Bets must be placed on Betfair Sportsbook. 10. Only customers who register with code ZSKACT and deposit using Cards or Paypal can take part in this promo. 11. All qualifying bets must settle before the bonus expires, 90 days after you buy-in. 12. You must have settled bets to the value of four times your buy-in and bonus amount before the bonus and winnings are automatically transferred into your main wallet and available for withdrawal. 13. You must complete the betting requirement within 90 days to withdraw. What do I need to know about the betting requirement? 14. While playing through your bonus, all bets placed that meet the betting requirements will automatically be placed using funds from your bonus wallet first and then your main wallet if required. 15. If you are using both funds from your main wallet and bonus wallet to place a qualifying bet, funds to place a bet are first taken from the bonus wallet, and then the main wallet if required. Winnings are then first put back in the main wallet and then the remaining winnings are put into the bonus wallet. For example if you have £7 in your bonus wallet but you place a qualifying bet of £10, the bet will be placed using £7 from your bonus wallet and £3 from your main wallet. If your bet wins, £3 of the winnings will be put into the main wallet and the rest into the bonus wallet. 16. If you Cash Out a bet placed using the bonus, you'll receive the winnings into the bonus wallet. This will not count towards your betting requirements for the bonus. 17. If your bonus wallet balance is zero but the promotion is still active (i.e. you’re waiting for eligible bets to settle – that were placed towards your betting requirement) then you may still place further bets that will be funded from your main wallet, and as long as these bets meet the eligibility requirements (i.e. eligible markets and min.odds), then they will still count towards your betting requirements to unlock your bonus. 18. While active in this promotion, only bets that do not qualify as part of the betting requirements will come out of your main wallet directly (i.e. bets on non-eligible markets or below the minimum odds). These will settle into your main wallet as normal. 19. This offer is only available to customers residing in UK and Ireland.Price Rush and Multiple bets count. 20. Bets placed on Virtual Sports will not count towards the betting requirement. 21. Once you buy in you will have 90 days to complete the betting requirements of your buy-in and bonus. 22. If the betting requirements for this offer have not been met within 90 days total funds held in your bonus wallet will be forfeited. 23. In the case of cancelled, voided, rejected or non-runner bets - stakes will be put back into the original wallets and any winnings earned from money used towards the betting requirement will be lost. 24. If the bonus wallet reaches zero - or the expiry date passes - the bonus is closed and no funds will be transferred into the main wallet. 25. If you cancel your bonus: After you buy-in and claim bonus but before you complete the betting requirements then any funds in your bonus balance will be forfeited except for the any remaining buy-in funds, which will be returned to the main wallet. 26. You can only have one active bonus at any one time. To claim another bonus the current active bonus must be completed or closed first. 27. This offer only applies to bets placed via desktop, mobile or tablet. Telephone betting service will not qualify. 28. All Betfair offers are intended for recreational players and Betfair may in its sole discretion limit the eligibility of customers to participate in all or part of any promotion. 29. All customer offers are limited to one per person, family, household address, email address, telephone number, same payment account number (e.g. debit or credit card, PayPal etc. ), and shared computer, e.g. public library or workplace. We reserve the right to withdraw the availability of any offer or all offers to any customer or group of customers at any time and at our sole and absolute discretion. Offers only apply to customers who have made an actual/real money deposit with Betfair. 30. Betfair reserves the right to amend, cancel, reclaim or refuse any promotion at its own discretion. 31. Only bets placed on the first selection in any market/fixture combination, both pre-match and In-Play, will count towards any turnover requirements. Any subsequent bets placed on other selections in the same market/fixture combination will not count towards the turnover requirements. "Betfair £100 free bet offer - Exclusive 100% matched bonus!"